This article complements the previous article, Evidence for Atlantis, by Hutton Commentaries subscriber, Norman Scherer. Since 1932, deep-sea-floor rock-coring and dredge-haul sampling techniques have been greatly improved. Several nations now routinely investigate the ocean floor record in the rocks from specially outfitted ships operating globally. Thus, because the field of ocean floor rock investigation has widened dramatically, new interpretations of Earth's history are brought forward ever more rapidly. 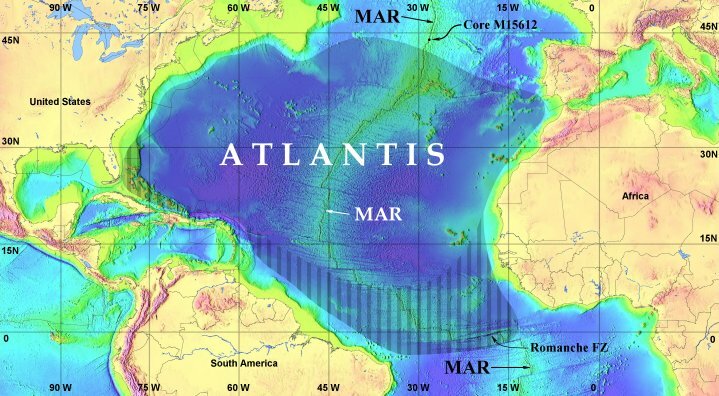 We will look here at one area of the Atlantic Ocean floor that seems to provide evidence of sinking “of the southernmost portion” of the Atlantean continent. (See 364-6 below). Here are two reading extracts that bear upon the boundaries of Atlantis. We will use their information, together with that in 364-3 above, to plot the outline of Atlantis at the time of an individual named Amilius. In the period, then - some hundred, some ninety-eight thousand years before the entry of Ram2into India there lived in this land of Atlantis one Amilius, who had first NOTED that of the separations of the beings as inhabited that portion of the earth's sphere or plane of those peoples into male and female as separate entities, or individuals. I am not a student of East Indian ancient history. My impression from the scant reading I've done, however, is that the latest that an “entry of Ram into India” could have occurred is about 3500 years ago, with the entry of Aryan tribes into the country. This is known as the Aryan invasion. But this particular individual, Ram, could have come to India far earlier, in an entry either peaceful or warlike. Thus the “time of Amilius,” mentioned in 364-6 below, would have been at minimum about 100,000 years ago. Q) How large was Atlantis during the time of Amilius? [100,000-plus years ago]? A) Comparison, that of Europe including Asia in Europe - not Asia, but Asia in Europe - see? This composed, as seen, in or after the first of the destructions [about 19,400 years ago; see Table 1], that which would be termed now - with the present position - the southernmost portion of same - islands as created by those of the first (as man would call) volcanic or eruptive forces brought into play in the destruction of same. That [westernmost portion of Atlantis] along the Atlantic board formed the outer portion then, or the lowlands of Atlantis. Using a Webster's Geographical Dictionary, published by Merriam in 1949, I followed the word description for the boundary of Europe on page 347, and the maps found on Plates X and XI. I learned that the operative boundary specifications for Europe include the far northern islands of Novaya Zemlya, Kolguev, and Svalbard. Also, the eastern boundary of Europe is the Ural Mountains, the Ural River and the Caspian Sea. Turkey in Asia is, obviously, not considered part of Europe, whereas Turkey in Europe is considered to be.3 The islands and peninsulas of the Mediterranean Sea are part of Europe. The most southerly point of Europe is in Spain, at 36º 2' N.
I placed a piece of tracing paper on my globe and traced the outline of Europe. Then I cut out the tracing and transferred it to the Atlantic Ocean part of the globe. The cutout fit comfortably into the north Atlantic basin without overlapping adjacent lands anywhere. After marking the boundary of the “European Atlantis” cutout on the globe, I added some “protruding portions” for the Bahamas and southern Atlantis. Then, after expanding the boundary of the legendary island to the 2000-fathom (12,000 ft) depth contour adjacent to the continents, I got the approximate boundary of Atlantis shown on Figure 1. The northern shore of the legendary continent could not have extended farther north along the Mid-Atlantic Ridge MAR) than 44º N. See the label, “Core M15612,” on Figure 1. Three scientists (M-H. Park, and Others, 2001, in Atlantic Geology, v. 37, pp. 153-160) analyzed 14 radiocarbon dates run on samples of foraminifera tests at various depths in the core. The carbon dates ran from 2,000 to 40,000 years before the present (B.P.). They then interpreted the age of the undated lower part of the core to represent uninterrupted sediment deposition going back as far as 160,000 B.P. Thus, assuming that the scientists did their research properly, this point on the MAR has been under the ocean for 160,000 years and could not have been part of Atlantis. I assumed that, just as the Bahamas were said to have been at one time a part of the Atlantean continent (364-3), so also might one expect that the Madeira, Canary, and Cape Verde islands had also once been part of Atlantis. And so also might portions of the equatorial Mid-Atlantic Ridge and surrounding areas once have been “- with the present position - the southernmost portion of same [Atlantis].” Note that the phrase, “with the present position” (in 364-6), clearly implies that a shift of Earth's rotational axis brought Atlantis, as well as planet Earth, to its present orientation in space. This is important because, as we shall see, six scientists working with the record of the rocks in the equatorial Atlantic require a pole shift to explain 1) a shift in the location of an ocean trench, and 2) how crustal blocks were once uplifted or submerged there. Fig. 1. Approximate outer limits of Atlantis at its greatest extent. Vertical-stripe pattern indicates “protruding portions within this [Atlantis] that must have at one time or another been a portion” of the legendary lost continent. MAR = Mid-Atlantic Ridge; FZ = fracture zone. The above heading is the same as the title of a paper published in 1981 in the journal Tectonophysics. Enrico Bonatti, of Columbia University and the Marine Geology Laboratory in Bologna, Italy, and Andy Chermak, of the University of Miami, are the authors. The National Science Foundation (NSF) and the Office of Naval Research (ONR) sponsored their work, and it was carried out on the Romanche fracture zone shown on Figure 2. Fig. 2. Schematic representation of the structural pattern associated with the Romanche and other equatorial Atlantic fracture zones. SPSP = St. Peter/St. Paul islets. DSDP 25 = Deep Sea Drilling Project, sea-floor boring no. 25. Solid black triangle indicates sites where shallow water limestones were recovered. Modified from Fig. 1 of Bonatti and Chermak. Among the results of their study, Bonatti and Chermak identified a strip of sea floor over 300 miles in length along the Romanche fracture zone (FZ) that is anomalously shallow by at least six-tenths of a mile relative to predicted depths. They suggest that the sea-floor high spots are capped by carbonate banks representing stages when they reached close to, and possibly above, sea level. They then estimate that the rate of uplift and sinking of the anomalous crustal blocks was about twice as fast as other crust of equivalent age. The authors note further that at the Deep Sea Drilling Project (DSDP) hole 25 (Fig. 2), Eocene age shallow water limestones were recovered. They suggest that the emergent crust “may even have provided ‘land bridges' for faunal migrations between Africa and South America in early Cenozoic times after the two continents had already been separated.” It is here that they bow to the hypothesis of sea-floor spreading and plate tectonics to explain their findings. That was in 1981. Only ten years later, however, the authors' sea-floor spreading interpretation was to be disputed. Ten years later we learn of Russian oceanographers hauling up all kinds of unusual dredge samples from the vicinity of the MAR, or from the slopes of the St. Paul FZ (see Fig. 2). I won't describe all of the various rock types recovered except to say that many dredge samples contained continental type rocks and microfossils.4 This led the authors to conclude, as follows. The finds of continental rocks and sediments whose age is older than that determined by paleographic reconstruction in accordance with the ‘canons' of plate tectonics are an important addition to geophysical data suggesting the ‘non-spreading' origin of flank plateaus in the equatorial segment of the MAR…..A platform still persists on the downwarped flank plateaus of the MAR because sea-floor spreading was limited entirely to the axial part of its equatorial segment. It's time for scientists to start trying to understand vertical sea-floor changes over time through more than the predominantly horizontal sea-floor spreading/plate tectonics model. Recall that we have presented a different model to explain what could have been going on along the MAR in our review of Prof. MacKenzie Keith's article on the plate tectonics theory's “house of cards.” Our review is entitled: “New Hypothesis Provides A Basis For The Reality Of The Legendary Continents Of Atlantis And Lemuria --The demise of the current sea-floor spreading and plate-tectonics theory.” In our review we explain how Keith's new model contributes to an understanding of the origin and destruction of the Atlantis of Cayce's readings. Fine, but I really don't believe it necessary to do mental handsprings to make everything one observes fit into the plate tectonics mold. Rather than try to do so, let's just take Bonatti's finding, and see if it might not fit in with the readings' story of the first destruction of Atlantis. Suppose that the continent was in fact broken up 19,400 years ago by a man-induced, super-massive, volcano-like eruption that caused Atlantis near the Sargasso Sea to “go into the depths.” This was the upheaval that broke up the continent into five large islands and many smaller ones. The upheaval probably even started a pole shift. Could it not be possible that this event might also have massively affected the equatorial Atlantic sea floor as well? If so, the uplift of sub-continental, or sub-oceanic mantle would not have been much of an aberration, would it? And the sinking of any above-sea-level oceanic crust wouldn't be much of an aberration either. Date In Years Before The Present (B.P.) Geophysical Event(s) Reading Nos. 20,000 Age of an entire woolly mammoth found @ 62° N, 150° E.
19,400 Man-induced eruption causes the portion of Atlantis near the Sargasso Sea to go "into the depths." Volcano-like upheaval separates Atlantis into five islands and induces a pole shift (author's interpretation) causing ice sheets to melt in Europe, Asia, and North America. 364-11, 364-4, 877-26, 440-5, 1291-1 (?) 488-5? Beginning and ending dates of the Younger Dryas climatic event during the middle of the ongoing deglaciation of the North Atlantic region. This 1,300 ± 70-year period marked a return to glacial-like climatic conditions. It terminated abruptly with a 7°C rise in temperature over a few years' time. Note that the final destruction of Atlantis and the construction of the Great Pyramid occurred during this Younger Dryas period. Bonatti's most recent paper,6 co-authored with five others, tries further to explain vertical tectonics at the Romanche fracture zone. Flat-top peaks on the summit of the transverse ridge are capped by acoustically transparent, weakly stratified, shallow water platform/lagunal/ reef limestones. This limestone unit is a few hundred meters thick and overlies igneous basement. Evaluation of the seismic reflection data as well as study of samples of carbonates, ventifact basaltic pebbles and gabbroic, peridotitic and basaltic rocks recovered on the transverse ridge, suggest that … the summit of the transverse ridge was above sea level at and before about 5 Ma [five million years ago]. So there you have it, a submerged, ridge-shaped former island right smack in the middle of the equatorial Atlantic. Is this island part of the remains of the southernmost portion of the Atlantis of Cayce's readings? Maybe. Read further. But how are we to explain Bonatti and Others' five million years of submergence, when the readings would indicate that the island sank less than 19,400 years ago? If this transverse ridge was one of the remaining islands after a man-induced blowup, then it sank before about 12,000 BP because the last island of Atlantis, Poseidia, sank in 11,900 BP, according to two readings (see Table 1). But Bonatti and Others infer that the island sank long before the ice age, at the beginning of the Pliocene epoch, roughly five million years ago. The only way to explain the time discrepancy is to assume that the Earth has experienced many pole shifts through the ages. A pole shift can radically alter sea levels and raise and lower blocks of the crust. What appears to Bonatti and Others to have happened only once, and five million years ago at that, could have happened many times over such a long period, if Cayce's readings can be believed. The Mediterranean Sea almost dried up (became desiccated) around five million years ago. This event occurred within the time frame proposed by Bonatti and Others for jostling of crustal blocks in the equatorial Atlantic. between 5.96 and 5.33 million years (Myr) ago—was one of the most dramatic events on Earth during the Cenozoic era. It resulted from the closure of marine gateways between the Atlantic Ocean and the Mediterranean Sea, the causes of which remain enigmatic. Here we use the age and composition of volcanic rocks to reconstruct the geodynamic evolution of the westernmost Mediterranean from the Middle Miocene epoch to the Pleistocene epoch (about 12.1-0.65 Myr ago). Our data show that a marked shift in the geochemistry of mantle-derived volcanic rocks, reflecting a change from subduction-related to intraplate-type volcanism, occurred between 6.3 and 4.8 Myr ago, largely synchronous with the Messinian salinity crisis. Using a thermomechanical model, we show that westward roll back of subducted Tethys oceanic lithosphere and associated asthenospheric upwelling provides a plausible mechanism for producing the shift in magma chemistry and the necessary uplift (1 km) along the African and Iberian continental margins to close the Miocene marine gateways, thereby causing the Messinian salinity crisis. The shift in magma chemistry and 1 km (0.62 mi) uplift of the African and Iberian continental margins seems clearly to find a match with Bonatti and Others' findings of transform migration and vertical tectonics at the Romanche fracture zone some 5 Myr or so ago. And Bonatti's team believes that a pole shift was responsible for the vertical motions that it found in the equatorial Atlantic, not so far from Africa and Spain. Where Duggen and others worked. One wonders whether Duggen and Others (2003) ever read the article by Bonatti and Others (1994). It's clear, however, that even though Bonatti and Others had the sense to invoke a pole shift to supply the energy for the block motions that they studied, both Bonatti's and Duggen's groups attempt to explain their requirements for vertical tectonics, either largely or exclusively, by resorting to the plate-tectonics model of geodynamics. There is plenty of evidence for formerly emerged crustal blocks in the floor of the equatorial Atlantic. And it is just possible that, for up to a few thousand years, these now-submerged blocks may have been islands left by the destruction of the Atlantis of Cayce's readings. Destructions of various parts of Atlantis began 19,400 years ago (the first destruction) and continued until 11,900 BP when the final island of Poseidia sank, or over a period of 7,500 years. The islets of St. Peter and St. Paul could have been upthrust any time during or after the first destruction of Atlantis. Bonatti and Others' most recent paper (1994) makes a valiant attempt to explain the equatorial Atlantic tectonics scene, almost exclusively according to the sea-floor spreading and plate-tectonics theory. The authors invoke “jumping” ridges, uplift and sinking of micro crustal plates, and “migrating transform faults.” At one point, the authors invoke a pole shift. This is done to try to explain the migration of the “fossil” Romanche rift valley. Actually, the article by Bonatti and Others is brilliant and who am I to cast aspersions on it. Our differences stem from contrasting sets of assumptions, and from the models of crustal dynamics that are built upon those assumptions. Bonatti and Others assume that sea-floor spreading must be taking place in the equatorial Atlantic floor. Our model assumes that sea-floor spreading is not the driving mechanism behind sea-floor tectonics, except in near-MAR areas, following M. Keith's model for the development and later submergence of the Atlantic Ocean floor. (Remember also that the Russian oceanographers reached the same conclusion, from their “hard data,” with regard to the limited amount of sea-floor spreading, and that localized only near the axis of the MAR). Furthermore, our model of Atlantis's geophysical history is based upon information channeled by Edgar Cayce that is assumed by us to be true for the broad history of sea-floor tectonics of the Atlantic Ocean basin. This psychic information is “tested” with our computerized procedure for determining the effects of pole shift on worldwide crustal dynamics and sea levels. There is a major qualifier to the story of the submergence of southern Atlantis that I have woven in this article. Assuming that the Cayce readings on Atlantis are true, the following qualifier obtains. Mention of the sinking “of the southernmost portion” of the Atlantean continent in 364-6 may actually refer to sinking of a region that is farther north along the MAR, “near what would be termed the Sargasso Sea [that] first went into the depths” (364-4). Let's review three important readings on the destruction of Atlantis. With the continued disregard of those that were keeping the pure race and the pure peoples, of those that were to bring all these laws as applicable to the Sons of God, man brought in the destructive forces as used for the peoples that were to be the rule, that combined with those natural resources of the gases, of the electrical forces, made in nature and natural form the first of the eruptions that awoke from the depth of the slow cooling earth, and that portion now near what would be termed the Sargasso Sea first went into the depths. (Q) Describe in more detail the causes and effects of the destruction of the part of Atlantis now the Sargasso Sea. (A) As there were those individuals that attempted to bring again to the mind of man more of those forces that are manifest by the closer association of the mental and spiritual, or the soul forces that were more and more as individual and personal forms in the world, the use of the these elements - as for the building up, or the passage of individuals through space - brought the uses of the gases then (in the existent forces), and the individuals being able to become the elements, and elementals themselves, added to that used in the form of what is at present known as the raising of the powers from the sun itself, to the ray that makes for disintegration of the atom, in the gaseous forces formed, and brought about the destruction in that portion of the land now presented, or represented, or called, Sargasso Sea. The use of these influences by the Sons of Belial brought, then, the first of the upheavals; or the turning of the etheric rays' influence FROM the Sun - as used by the Sons of the Law of One - into the facet for the activities of same -produced what we would call a volcanic upheaval; and the separating of the land into SEVERAL islands - five in number. One of the hypotheses for the formation of the Atlantis Massif proposes that the Atlantis Massif is rising along faults, such as a detachment fault on the east side of the Massif. If so, rock types found at depth should begin to be exposed along the east flank of the Massif (also the footwall of the proposed detachment fault). Again, the first destruction of Atlantis occurred around 19,400 years ago when a huge portion of the island continent near or in the Sargasso Sea sank into the depths. The cause of this destruction was man-made. It produced a volcano-like eruption of unprecedented fury, originating as it did in the Earth's lower crust and mantle. Would we not expect to find evidence for this upheaval somewhere in or around the Sargasso Sea? Consider now the expedition of an international team of scientists to a submerged mountain on the MAR, in November and December 2000. The scientists studied the Atlantis Massif9, a large mountain of mantle rock that has been upthrust through younger rocks of the ocean floor. Check their website article, “Descent to Mid-Atlantic Ridge” for a marvelous virtual adventure. The two graphics used here are linked from this web article. Note the square of light blue (“Field Area” to right) for the location of the Atlantis Massif, and recall that the first destruction of Atlantis affected the part of Atlantis near (or in) the Sargasso Sea. The location of the Atlantis Massif (Fig. 3) is in such a place. In my book, Coming Earth Changes, I suggested (p. 156) that the Sargasso Sea is bounded by 23º to 35º N and 35º to 72º W. This puts the location of the Atlantis Massif in the extreme northeastern corner of the Sargasso Sea. …carbon-14 age dating indicates that normal faulting, breccia formation, sedimentation, veining, and venting [episodes at the massif] have been broadly contemporaneous and commenced at least 30,000 to 34,000 years ago…[and] …the carbon-14 dates of the veins are close to true ages. Q) What was the date of the Peruvian incarnation as given in Life Reading, and what was the disturbance in the earth as mentioned? Give such details as will clear up this period. A) As indicated from that just given, the entity was in Atlantis when there was the second period of disturbance -which would be some twenty-two thousand, five hundred (22,500) before the periods of the Egyptian activity covered by the Exodus; or it was some twenty-eight thousand (28,000) before Christ, see? Then we had a period where the activities in the Atlantean land became more in provinces, or there were small channels through many of the lands. Did the scientists investigating the Atlantis Massif just happen to do so because they had funding for an expedition? In part. Or were they drawn by karma to the Atlantis of the Cayce readings, where they had once lived? Indeed, is it not possible that their descent to the MAR represents a confirmation, however minimally, of reading 1602-3 below? Q) Three hundred years ago Jacob Boehme decreed Atlantis would rise again at this crisis time when we cross from this Piscean Era into the Aquarian. Is Atlantis rising now? Will it cause a sudden convolution and about what Year? A) In 1998 we may find a great deal of the activities as have been wrought by the gradual changes that are coming about. These are at the periods when the cycle of the solar activity, or the years as related to the sun's passage through the various spheres of activity become paramount or Catamount [?] [Tantamount?] to the change between the Piscean and the Aquarian age. This is a gradual, not a cataclysmic activity in the experience of the earth in this period. The following description and the chart are from Jan Alvestad's site, “Solar Terrestrial Activity Report“ for June 19, 2003. “[The chart shows] a graphical comparison of solar cycles 2, 10, 13, 17, 20 and 23. Solar cycles 2, 10, 13, 17 and 20 are those that most easily compare to the development of cycle 23, particularly cycles 17 and 20 developed similarly to cycle 23. The chart below displays the development of all those cycles during their 6 first years. Alvestad's chart shows clearly the double peaked nature of this latest solar cycle. It was “paramount” between roughly months 42 and 72 after it began. Solar Cycle 23 began in about February 1996. Yes, the years 2000-2002 did represent the peaking of solar cycle 23, and, presumably, the change between the Piscean and Aquarian ages. Well what about “Atlantis rising” during this period? When scientists take samples of a mantle mountain (the Atlantis Massif) located in or near the Sargasso Sea and bring them to the surface, is that not a sort of rising of physical Atlantis? Too much of a stretch, I say. But then again, who knows what may follow? Are we not close to a paradigm shift in our understanding of Earth history? Before that we find the entity was in the Atlantean land, when there were the constructive forces as to the activities of the children of the Law of One, - in all of those influences during the periods when the land was being broken up. We find the entity was as the leading influence for the considering of ways and means in which there would be the preserving of records, as well as ways, means and manners in which either the few or the numbers might be preserved from the destruction of the lands. It would be well if this entity were to seek either of the three phases of the ways and means in which those records of the activities of individuals were preserved, - the one in the Atlantean land, that sank, which will rise and is rising again [Hutton's emphasis added]; another in the place of the records that leadeth from the Sphinx to the hall of records, in the Egyptian land; and another in the Aryan or Yucatan land, where the temple there is overshadowing same. Christian O'Brien in Chapter 18 of The Shining Ones features the basic historical and geological evidence which identifies the Azores as the site of the Island of Atlantis. In an outstanding career as exploration geologist he is no stranger to successfully challenging established perceptions and raises the key issue of the deep crustal rifting associated with such flood basalt constructions. The technology needed to prove or disprove the Atlantis issue is now available. Science has reached the point of being able to understand both the creation of' such large structures and the subsequent catastrophic movements in the Earths crust, which have destroyed them. Finding and dating the remains of fresh water life at depths of up to 4000 meters, finding coral, sandy beaches and volcanic material below sea level and identifying former river valleys is within reach and we look forward to providing further news on this subject later in the year. So far this century [last century actually, Hutton's correction] there has been a confirmed report of a one mile rise in the floor of the ocean 576 miles north of the Azores when a trans-Atlantic cable broke. [Emphasis added by Hutton]. Dr David F. Zhirov [Prof. N. Zhirov, Hutton's correction] in 1970 reported sand beaches and coral at depths of 2 miles south of the Azores. Confirmed evidence exists that sections of the Mid-Atlantic ridge have been above sea level in the past and [fresh-] water diatoms have been found 2 miles down in the Azores area dated 10,000 to 12,000 BC. Try as I might, I have been unable to confirm this assertion of a one-mile rise in the floor of the ocean some 567 miles north of the Azores. Others may be able to determine the veracity of the statement. Note also that Christian O'Brien produces an interesting map of his concept of the last big island of Atlantis to be submerged. This is called Poseidia in Cayce's readings, and its final destruction was said (readings 364-1, 288-1, and 339-1) to taken place between 12,700 and 11,900 B.P. (years before the present), or approximately 10,700 to 9,900 B.C. Although I have not studied O'Brien's data and assumptions behind his map, it brings an exploration geologist's perspective to the same area that The Hutton Commentaries believes was the last part of Atlantis above the waves before the final destruction; i.e., Poseidia. Seismic evidence. We searched the National Earthquake Information Center's database for quakes within the area enclosed by the boundaries of Figure 3. This is the Poseidian-Atlantis “target area” that we believe is described in reading 2012-1 at the beginning of this section. This search, from 01/01/1973 through 06/27/2003, turned up 724 earthquakes greater than M 3.0, with focal depths between 5 and 33 km (3.1-20.5 miles) out of a possible depth of 100 km. The three largest earthquakes had magnitudes of M 6.2, one of M 6.3, and one of M 6.6. Over the period, there were three clusters of 8 closely-spaced-in-time quakes, one cluster of 9 (in 2003),one cluster of 13 (in 1997), one cluster of 24 (in 1974), one cluster of 28 (in 2001), and one cluster of 35 (in 1996-1997). For further information on the earthquakes statistics is presented in Table 2. Table 2. Statistics for Earthquake Survey of Figure 3 Area Discussed in the Text. Note well that the Poseidia that we believe could have existed is not in the vicinity of Bimini in the Bahamas. It is in the Azores region. Thus, it seems probable to us that the M 7.6 earthquake shown on Figure 3 could simply have been heralding the beginning of the first portions (here the Poseidian portion) of Atlantis's slow rising. What is striking to Hutton is the location of the 35-quake cluster of 12/21/1996 -03/04/1997. The two-month quaking of the crust, including seven quakes greater than M 5.0, occurred to the west of the median valley of the MAR, almost at the end of the 1958-1998 period mentioned in 3976-15 as being the period during which the Earth changes would be beginning. The next largest cluster (28 quakes in 03/2001) occurred in the "Anomalous Area," again, west of the median valley of the MAR. If anyone is going to find evidence of the rising of this part of Atlantis (sunken Poseidia of the readings), he or she will probably find it most readily in one of these two places. The evidence would be obtained from analysis of old and new bathymetric surveys that traversed the areas. Bottom depths from surveys before 1960 should be deeper than those found in the years 2000-2003. Then again, we must remember that aseismic slip might play a role in the gradual elevation of Atlantis. This is the process by which crustal blocks move along fault surfaces without producing easily detectable earthquakes. Fig. 3. Physiographic reconstruction of Poseidia (called here Poseidonis), after N. Zhirov, as based on a diagram by B. Heezen and M. Tharp. Note the location of the major (M7.6) earthquake of 1968. (Recall too this reading fragment, "And Poseidia will be among the first portions of Atlantis to rise again. Expect it [to begin clearly to rise?] in sixty-eight and sixty-nine…."[958-3]). A repository for the records of the Atlantean civilization may be found in the area shown by blue shading. The Atlantean records repository will be found in a specific temple "where a portion of the temples may yet be discovered." (See reading 440-5). See text for an explanation of red dots A-C, sites of deep-water sampling of subaerial material representative of an emergent continent. (Subaerial refers to conditions and processes that exist or operate in the open air on and immediately adjacent to a land surface). Here is information on a former emergent continent in the Atlantic Ocean that was summarized by MacKenzie Keith10 for former shallow water or emergent sites sampled by the Deep Sea Drilling Project (DSDP). The sampling sites are currently underwater in the region of the Mid-Atlantic Ridge (MAR). 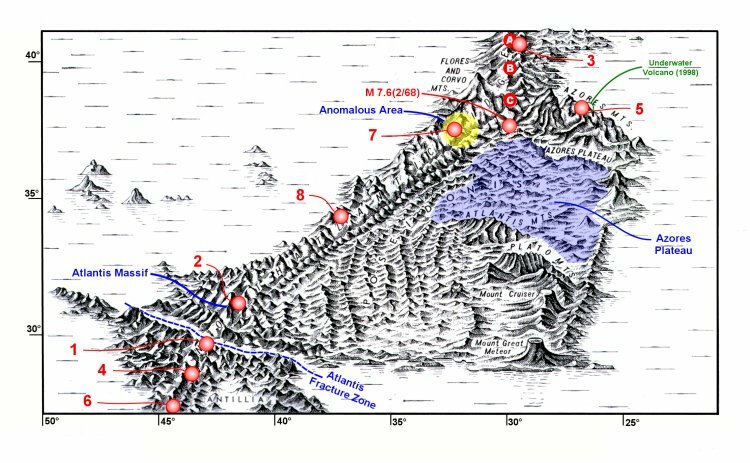 Locations for three of these sites (Keith, 2001, Table 1) are shown by large red dots on Figure 3, a relief map of the Azores region we have used in previous articles on THC's website. The red dots are rather large because, while the sampling coordinates that are listed give degrees north latitude, they do not give degrees west longitude. It is understood, however, that the samples were taken in the vicinity of the MAR's axial valley, clearly visible on Figure 3. Here's what was found at point A, at a depth of 12,802 ft.: highly vesicular basalt, weathered and oxidized basalt, and a major gap in the basal sedimentary section that indicates subaerial erosion. At site B, at a depth of 12,440 ft, basaltic pebbles and weathered and oxidized basalt were found. And at site C, in 12,313 ft of water, once again basaltic pebbles and weathered and oxidized basalt were found. All of the above findings are strong indicators of a formerly emerged MAR. And they suggest that this volcanic terrain has sunk a minimum of 12,300 ft since being exposed to the atmosphere. Note that Keith's Table 1 lists six additional MAR sampling sites-to the south of those plotted on our Figure 3 and on down to the equator. Two of these sampling sites show ridge tops flattened by wave erosion, one revealed Tertiary-age shallow water sediment, and another revealed Cretaceous-age shallow water sediment. A final, rather startling finding consists of canyons and a trellis drainage system, quite possibly formed subaerially at a depth greater than 9800 ft. That MAR location is between 26º and 27ºN, to the south of the area covered in Figure 3. The Azores Volcanic Plateau--A Hot Spot at a Triple Junction? Other geophysicists think that a hot spot lies beneath the plateau and that the plateau is an expression of a persistent rising plume of hot mantle material. The hot spot itself is perhaps 60 to 120 miles in diameter and the center is usually designated to be at about 38.5º N and 28.0º W, or located roughly at the red dot labeled ‘C' in Figure 3. …[men on Atlantis] brought in the destructive forces as used for the peoples that were to be the rule, that combined with those natural resources of the gases, of the electrical forces, made in nature and natural form the first of the eruptions that awoke from the depth of the slow cooling Earth, and that portion [of Atlantis] now near what would be termed the Sargasso Sea first went into the depths. ….the turning of the etheric rays' influence from the Sun – as used by the Sons of the Law of One – into the facet for the activities of same – [that] produced what we would call a volcanic upheaval; and the separating of the land into several islands – five in number ? This scientific inference is hugely at variance with the readings' explanation, as is the very idea of a formerly above-the-sea continent called Atlantis. Could the geologists' sea-floor-magnetic-stripe, age-determination procedures, and their hypothesis of exclusively horizontal sea-floor motions (with no appreciable vertical motions) be in error? If not, Atlantis is merely a thought form with no physical reality. If N. Zhirov's Poseidonis (Poseidia of the Cayce readings)13 was at the location shown on Figure 3 before its submergence, when the records of the history of Atlantis were being written, we can further assume that the Atlantean repository for these records will be found in the area shown by shading on Figure 3. This Atlantean records repository will be found in a specific temple "where a portion of the [submerged Atlantean] temples may yet be discovered." In attempting to speculate further on the location of this Atlantean temple, we find the following tantalizing information from p. 363 of Zhirov's book. It seems that in May 1968, Dr. R. Malise, the noted Swedish Atlantologist, wrote the following to Zhirov. The Danish engineer, M. Frandsen, was looking at a depth-chart of the Azores and observed that at a depth of 600-700 fathoms (3600 - 4200 ft) above the surrounding sea-bottom there was an even plateau to the south of the islands. This plateau is sheltered from the north by the present Azores with their summits 4,000-5,000 meters (13,120-16,400 ft) higher than it, and to the west by the main range [the MAR terrain]. To the southwest the plateau is limited by a somewhat lower mountain swell studded with high, flat-topped, now-submarine seamounts. The most prominent of these seamounts have been named by American oceanographers Atlantis, Plato, Cruiser, and Great Meteor. [See Figure 3]. As an experiment, Frandsen made a sketch with the measurements of the Atlantis Plain given by Plato, viz., 400 by 600 kilometers (250 by 375 miles) [Frandsen counted a stadius as 200 meters] and on the same scale as the chart. It fitted very well to the submarine plateau-land of the chart. By studying the depth-curves he found the declination of the plateau to be on an average 1:900; the plateau consisted accordingly of a real plain of a size about 2/3 of present-day Finland. On his sketch he drew in the contours of the mentioned canals and the circular ditch and likewise the squared lots of 'ten stadia each way.' According to Plato, the surrounding ditch had a length of ten thousand stadia (about 2,000 kilometers) and the number of squared lots was 60,000. By measuring the ditch on his sketch, Frandsen found it to be 2,040 kilometers and the number of lots to be 60,700, an acceptable difference. Having worked with irrigation in open and closed canals for thirty years he wanted to control the declination of the water level in the canals if adequate. He found the fall of the water to be 1:300 and1:600, which according to modern principles is acceptable, although barely for the last figure. The current in the canals was accordingly too slow to cause difficulties of navigation for the row-galleys of the time. If this plain housed the last portion of Atlantis to sink beneath the sea, we might expect that it held the major temples as well. 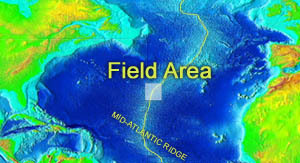 This area of the Atlantic seafloor looks like a very interesting one for oceanographers to explore. Multi-beam bathymetry surveys should be able to pick up signatures of canals without too much trouble. The famous marine geologist, Francis P. Shepard, once wrote something to this effect. "If we could look down from the Moon at the Earth without her oceans, the most prominent relief features that one could see would be the steep continental slopes. They look suspiciously like giant fault scarps." A variation to scientist Shepard's observation might read, "The steep continental slopes look like giant fault scarps surrounding a sunken region of Earth's crust, a region called, in some foolish quarters, Atlantis." In 1998 we may find a great deal of the activities as have been wrought by the gradual changes that are coming about. ...This is a gradual, not a cataclysmic activity in the experience of the Earth in this period. “This period” is linked in 1602-3 to the current, double-peaked solar cycle (number 23) that became “paramount” in 2000-2002. Cycle 23 is now in decline. Atlantis did not rise above the waves in 2000-2002, but consider that any evidence of a gradually rising Atlantis could easily still be concealed beneath the ocean's waters. To the foregoing I would add that geological processes like the elevation or sinking of large tracts of Earth's crust occur slowly in “human time.” Thus, the slow pace of Earth changes that occur in geologic time must temper the expectations of people used to thinking in terms of human time. An exception to this consideration is found, however, in accelerated Earth changes that would be caused by a sudden shift in Earth's poles of rotation. Without such a pole shift, predicted in 3976-15 to occur any day now, the predicted rising of parts of Atlantis will forever be judged to have been only a figment of the imagination for those of us living today. William Hutton's efforts in 1965-1968 to sample and analyze Bimini rocks by drilling, and by examining rock fragments from a deep sand-dredging operation at the Bimini inlet, are reviewed in his book, “Coming Earth Changes” (A.R.E. Press, 1996, pp. 165-180). Partial costs for that research were funded by the Edgar Cayce Foundation (ECF). Results of a 2002 study of rocks dredged from the Bimini lagoon can be found in the article entitled, "Bimini Revisited". That study was self-funded by William Hutton and Jonathan Eagle. An attempt to sample rocks and projections from the submerged cliff off Bimini was made in 1998-2000, under ARE sponsorship, but the results of that effort indicated nothing but carbonate rock had been sampled (J. Hanley, personal communication, 5/2003). Turkey in Europe is bounded on the north by Bulgaria, on the east by the Black Sea, and the Bosporus, on the south by the Sea of Marmara and Dardanelle's, and on the west by the Aegean Sea and Greece. Udintsev, G. B., and Others, 1990, “Finds of continental rocks and sediments of anomalous age in the equatorial segment of the mid-Atlantic ridge,” Doklady Akademii Nauk, v. 312, no. 2, pp. 450-454. Bonatti, E., 1990, “Subcontinental mantle exposed in the Atlantic Ocean on St. Peter-Paul islets,” Nature, v. 345, pp. 800-802. While Bonatti concluded that the midocean ridge is underlain by material left behind as the continents were rifted apart, there is a serious flaw in his argument. As explained by by A. Meyerhoff and H. Meyerhoff (1974, "Ocean magnetic anomalies and their relations to continents," in Kahle, C., plate tectonics--Assessments and reassessments, Amer. Assoc. Petroleum Geol., Tulsa, OK p. 415), "If the Mid-Atlantic Ridge is underlain by continental-type mantle, how are the allegedly young magnetic anomalies formed at the crests of the midocean ridges with attendant seafloor spreading? Bonatti fails to explain this. It is difficult to conceive of a mobile crustal layer at the surface of the midocean ridge underlain by what Bonatti terms a "stagnant" mantle. By his own admission, the newly formed basalt has to pass through the "stagnant" continental mantle." [Meyerhoff and Meyerhoff were citing Bonatti's 1971 paper in the Jour. Geophys. Research, v. 76, no.17, p. 3825-383, entitled “Ancient continental mantle beneath oceanic ridges.”]. Bonatti ignored the Meyerhoff criticisms in his 1990 Nature paper. Bonatti, E., and Others, 1994, “Transform migration and vertical tectonics at the Romanche fracture zone, equatorial Atlantic,” Jour. Geophys. Research, v. 99, pp. 21,779-21,802. Jardetzky, W., 1962, Jour. Geophys. Research, v. 67, no. 11, pp. 4461-4472. Duggen, S. and Others, 2003, “Deep roots of the Messinian salinity crisis,” Nature, v. 422, pp. 602-606. A massif (mas-sif') is a massive topographic and structural feature, especially in a mountain belt, commonly formed of rocks more rigid than those of its surroundings. These rocks may be protruding bodies of basement rocks, consolidated during earlier mountain building periods, or younger rocks of deeper origin. Keith, M., 2001, "Evidence for a Plate Tectonics Debate," Earth-Science Reviews, 55 pp. 235-336. Lourenco, N., and Others, 1998, “Morpho-tectonic analysis of the Azores Volcanic plateau from a new bathymetric compilation of the area,” Marine Geophysical Researches v. 20, pp. 141-156, plus map. Information in this paragraph comes from three abstracts in the Proceedings Volume for the December 1998 meeting of the American Geophysical Union (Abstracts T72F-07, T22C, and T12C-11). These abstracts describe the results of detailed sea-floor mapping programs southwest of the Azores hot spot, closer to the central Sargasso Sea. The studies cover an area where the normal V-shaped median valley of the MAR is interrupted by a messed-up area of the sea floor. Zhirov, N., 1970, “Atlantis,” Progress Publishers, Moscow.